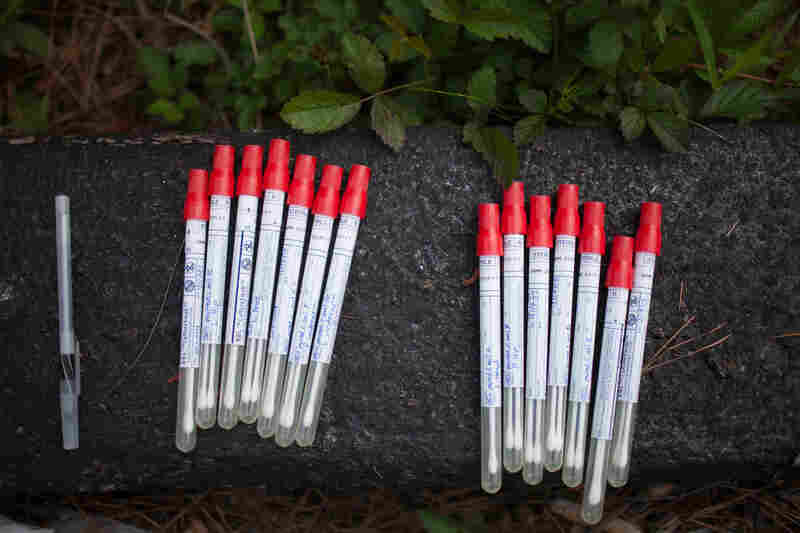 Could Detectives Use Microbes To Solve Murders? : Shots - Health News Long after we die, many of the microscopic creatures living in and on us continue to thrive. 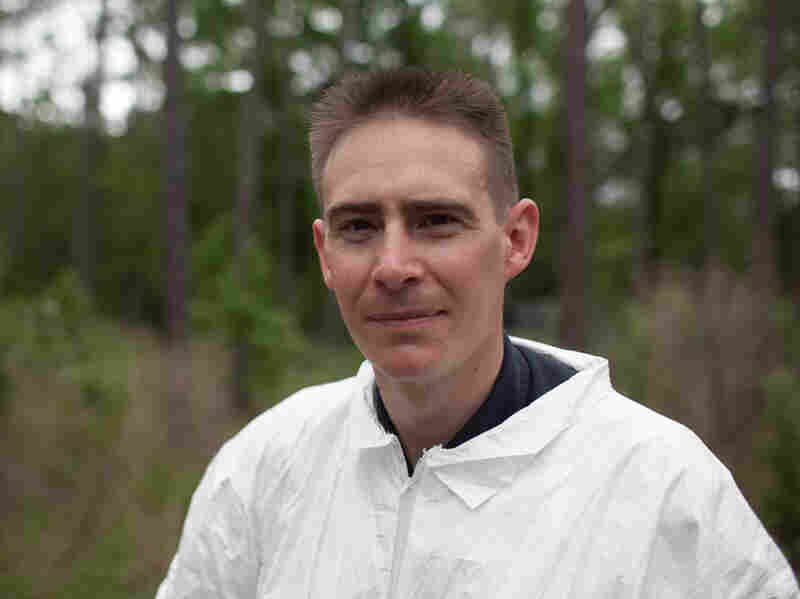 In field experiments, forensic scientists are tracking changes in communities of microbes on human remains that could one day serve as clues. Editor's Note: Viewers may find some of the following images disturbing. Sibyl Bucheli (center) and Rob Knight take soil samples from beneath one of the decomposing bodies. Bucheli is a forensic entomologist at Sam Houston State University in Huntsville, Texas, and a staff researcher at the Southeast Texas Applied Forensic Science Facility, which conducts research on human bodies that have been donated to science. "I'm deeply appreciative," Bucheli says, "of the people who make my research possible — all of them." Cotton swabs are used for sampling bacteria and other microbes from the skin of the corpses placed in the field. Researchers have found that, at least in mice, the communities of bacteria on corpses seem to change in predictable ways over time. Eventually working out this sort of "microbial clock" for various microorganisms on human bodies could help crime investigators pinpoint how long someone has been dead. From left, researchers Jessica Metcalf, Aaron Lynne, Bucheli and Daniel Harmaan mark the precise spot to place a fresh body. Metcalf and Harmaan collect soil samples before placing a body. The researchers will catalog any microbial colonies already living in the dirt and see how the communities of tiny organisms in that spot change over time. Bucheli hopes that eventually her microbial research will help answer one of the most important questions for families of murder victims: Who is responsible? 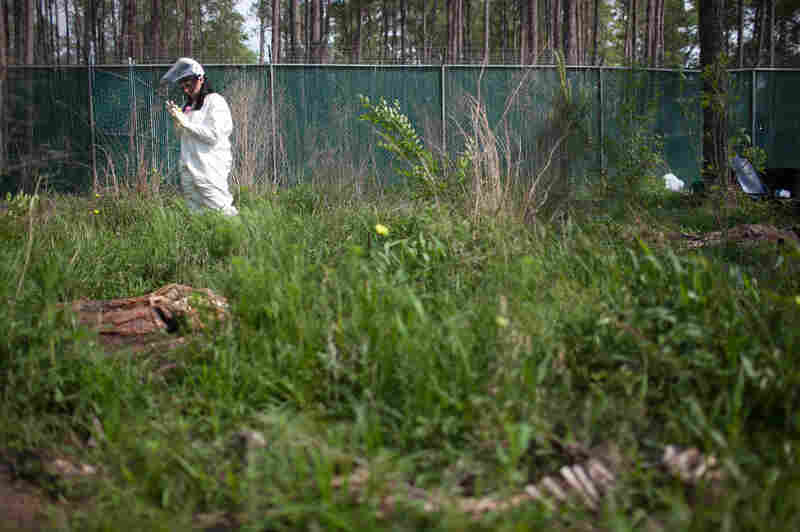 In the woods outside Huntsville, Texas, scientists are trying to determine whether they can use the microbes that live on the human body as microscopic witnesses that could help catch criminals. It's a strange scene at the Southeast Texas Applied Forensic Science Facility. 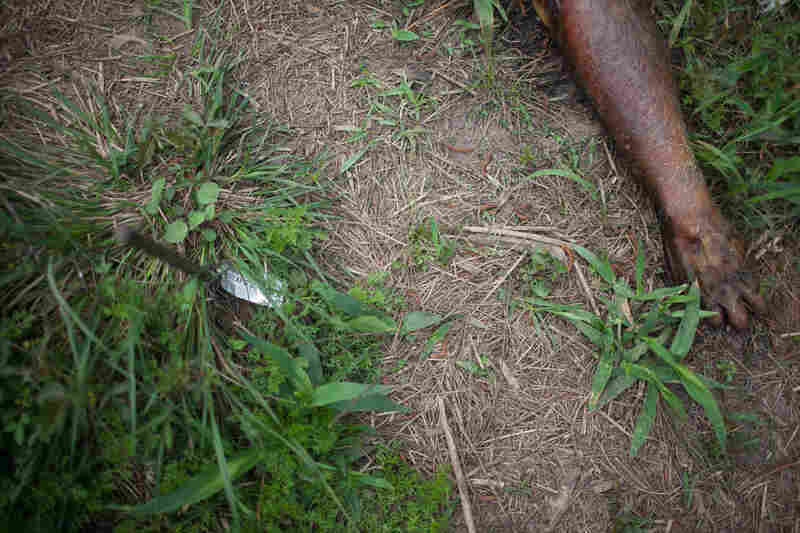 At first, it's easy to miss the human bodies scattered among the tall pines, wild grass and weeds. 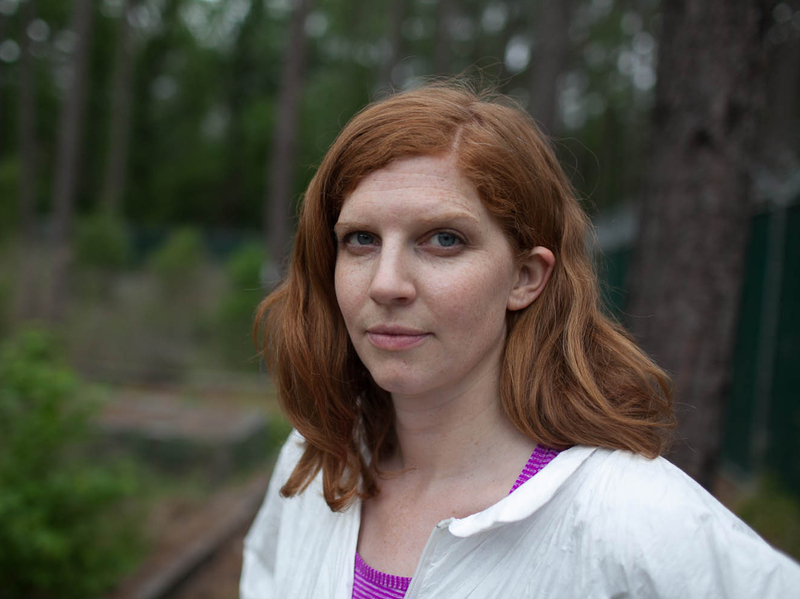 Jessica Metcalf, a microbial ecologist at the University of Colorado, says the mapping of changes in bacteria on human remains at the facility in southeastern Texas "is really pushing the envelope of microbial forensic science." "We hope microbes can tell crime scene investigators how long a person has been dead," Sibyl Bucheli of Sam Houston State University explains, as she leads a group of researchers and visitors from NPR through a tall, chain-link fence surrounding the facility and down a dusty path to her research plot. "We want to do this as respectfully as possible," says Sibyl Bucheli, a forensic entomologist at Sam Houston State University, who is now looking for patterns in the ways communities of microbes change as bodies decay. The facility is one of the few places where, in the interest of developing new tools for forensic science, researchers can leave human bodies out in the open to study what happens as the remains decompose. Bucheli is an entomologist who has spent years studying the ways insects on a body can help pinpoint how long a murder victim has been dead. Knowing how long it takes a particular species of fly to complete its life cycle from egg to larva to pupa to winged insect, for example, can help an investigator figure out how long a corpse has been exposed to the insects, establishing a minimum time since death. That got Bucheli thinking. "If insects change through time, then so do bacteria," she says. "And if insects can be used, so can the bacteria." It's possible, she says, that information from bacteria could improve the accuracy of these time-of-death estimates. The microbes might also be useful when insects aren't present, she says, helping to determine how long a person has been dead, when insects aren't available to do that. Such research is just in the beginning stages, but already, a scientific team at the University of Colorado has been able to use bacteria alone to narrow down how long a mouse has been dead to within three days. 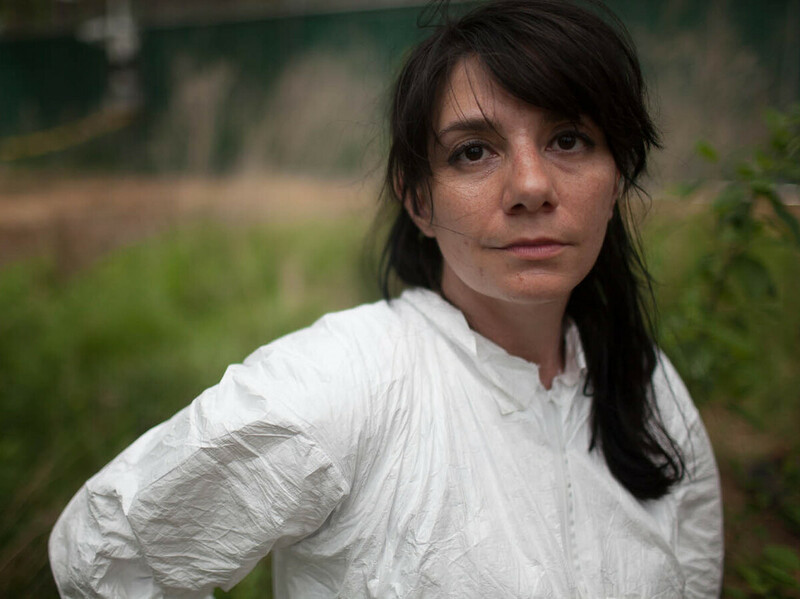 "We're really pushing the envelope of microbial forensic science," says microbial ecologist Jessica Metcalf, a member of that Colorado team. She and her boss, microbiome researcher Rob Knight, have come to the forensics facility in southeastern Texas to collaborate with Bucheli, hoping to do with human bodies what they did in the mice. One of the first tasks the day we visit is placing three fresh bodies in the woods. A small tractor pulls up, carrying the first body inside a blue plastic body bag. Three men lift the body off the tractor and place it on the ground. They unzip the bag and carefully unwrap the white sheet that swaddles the cadaver. "We want to do this as respectfully as possible," Bucheli says. It's a difficult moment. Corpses that have been in the field a little longer look like mummies, barely recognizable as human. The new remains are from people who have only recently died and donated their bodies for scientific research. Bucheli is clearly moved. She pauses briefly for what she calls her "thank-you moment." "I'm deeply appreciative of the people who make my research possible ... all of them," she says. 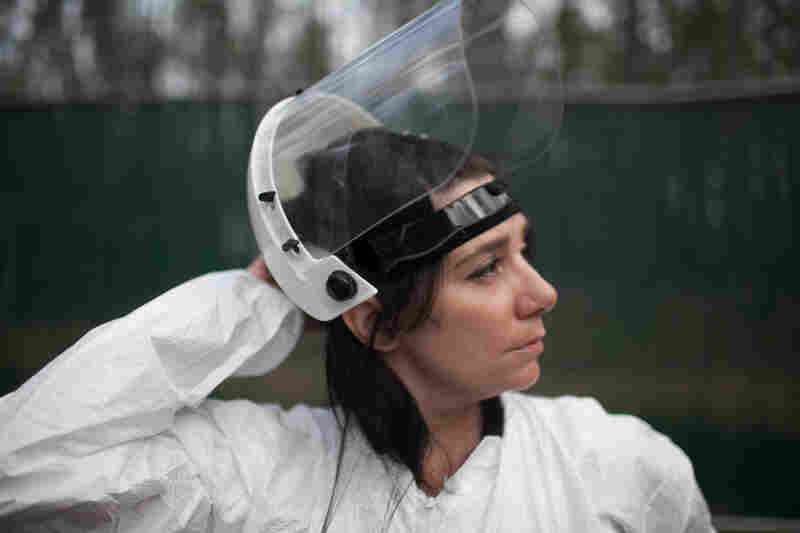 The scientists mark each body's position with a metal post and then begin several hours of intense work, meticulously gathering dozens of samples of bacteria. They carefully scrape the skin in the same spots on each body and methodically scoop up dirt from precise locations near the remains. Their plan is to come back day after day, month after month, to sample these exact spots, to figure out if, over time, the communities of bacteria in these various spots change in predictable ways as time passes and the remains decompose. "We're looking for a microbial clock," Metcalf says. A clock like that could be used as a reference tool in forensic investigations. Microbes might one day help police in other ways, too, the scientists say. The population of bacteria on a person who died of natural causes, for example, might look different than the bacteria on someone who was beaten to death. And because different varieties of microbes are found in different places, the bacterial census of a corpse might show whether a body has been killed in one place and then dumped in another. 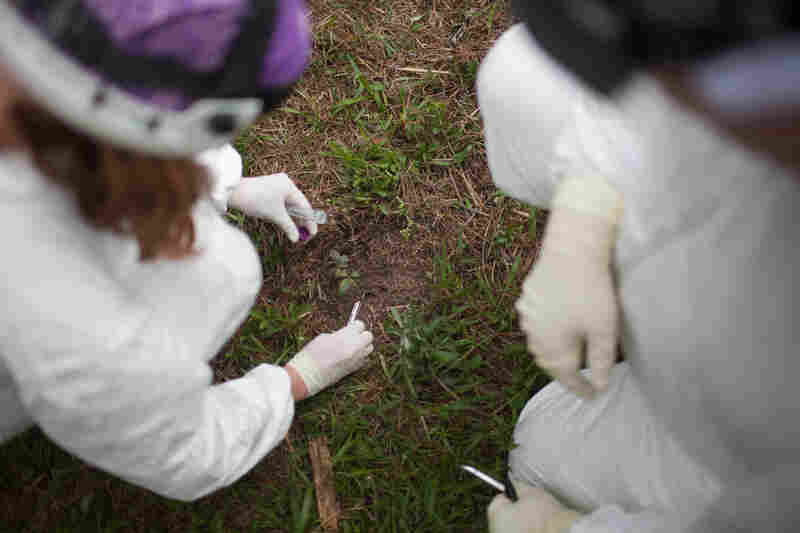 Microbes might also help police who are searching for unmarked graves. "If you suspected that there's a body buried in a certain field, can you just swab little bits of soil and say, 'Oh this particular area has microbial organisms that we usually find associated with a decomposing corpse?' " Metcalf asks. That's the sort of question she and Bucheli hope their work will help answer. And that's not all. Knight says he thinks microbes could one day provide for each of us a kind of microbial fingerprint that could help police solve all sorts of crimes while we're alive, as well as after we're dead. Back on campus, Knight demonstrates how it works. He pops open a small plastic vial, grabs a cotton swab and pulls out his laptop to test the keyboard. "You dip the Q-tip in the saline solution and you rub it thoroughly on the individual key," he explains. The swab quickly turns a greasy brown. "So what's on there is a combination of finger grease, dust and bacteria ... maybe as many as a billion," Knight says. "Definitely enough to track it back to an individual." Knight has been able to use an analysis of these communities of bacteria to match people to objects they've touched. So microbes might be able to do things like link a suspect to a murder weapon or the scene of the crime, he says. "There are a lot of cases where it's clear that the suspect touched something but you don't have a print you can use off it," Knight says. He even thinks that analyzing the different communities of microbes on peoples' bodies might eventually prove to be a useful tool for tracking an individual's movements — to see if the person had recently returned from Afghanistan or been in Boston, for example. All of this, Bucheli hopes, will one day help answer the most important question for the families of victims: Who is responsible? "I'm somebody's mom," Bucheli says. "I'm somebody's sister. You always think about: Who? Who did this?" Now, no one yet knows how much of this research will prove useful in forensics. Most practical applications are likely years away. But it's already clear that some of these techniques will likely raise lots of questions — about privacy, civil liberties and how much we want our microbes to reveal about ourselves.